Over the years i have been an unashamed brand snob when it comes to R/C brands. For many years i stuck with HPI cars and nothing else, looking down by nose at the more budget oriented brands with a look of distain. However about a year back i had an opportunity to get what in many ways was a dream job for me, to work at my local hobby shop. It has certainly been interesting, insightful and informative being on the “other side” of the hobby. For one thing i have a reformed attitude towards many brands. Haiboxing for example i expected to see nothing but and endless stream of broken cars coming back, however they are no less well built than the likes of vehicles from AARMA and Helion for example. One opportunity that presented itself recently was to examine and drive (in a somewhat limiited space i might add) some vehicles from the DHK Hobby range when Hobby Headquarters visited with a selection from their range. DHK’s philosophy is to create a significant, interesting, and exciting line of R/C hobby vehicles at the highest level of reliability, performance, and value. Certainly i was surprised with what seemed to be good designs and sturdy looking parts in their vehicles from a brand i had heard very little from. Now DHK are not new, just new in the Australian marketplace, however having their own factory seems to give the, flexibility and control in the design and construction process. 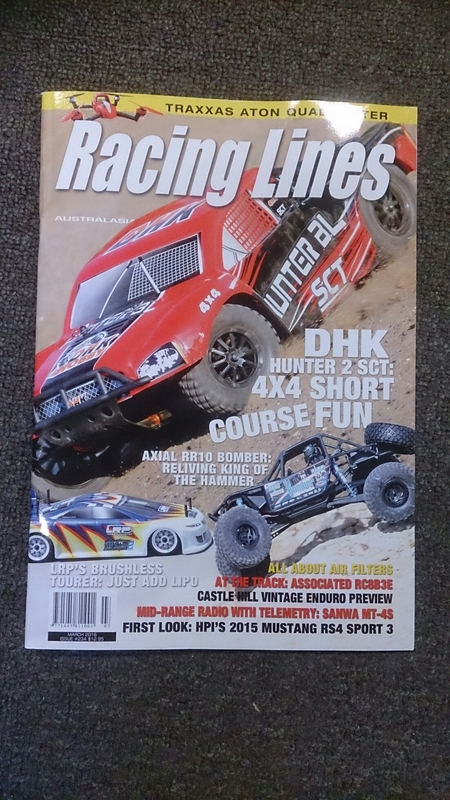 Of their range i was able to have a drive of the Hunter BL SCT (reviewed in the latest racing lines as the Hunter 2 for some reason), the Maximus brushless 1:8 truggy, the 1:10 Crosse 4×4 Monster Truck as well as have a good look at the Wolf BL 4wd buggy. On the whole i was suitably impressed with good power, strong looking designs and great looking vehicles. In many ways the range is a strong competitor to Traxxas, but without the expense associated with their vehicles, certainly a brand worthy of consideration! Details of the range can be found on the DHK website at http://www.dhkhobby.com , or ask at your local hobby shop. Issue 234 is hitting the shelves now, and this is what you can look forward to. -A new player in Australia, DHK, gets their Hunter Bl 4×4 thrashed and reviewed, although it is referred to as the Hunter 2 in the review. Even the one I just drove is stickered a Hunter BL, maybe a typo? -The final review is of the LRP s10 blast tc, a Brushless touring car that looks like a great unit. -And if course all of the latest racing news and reports.